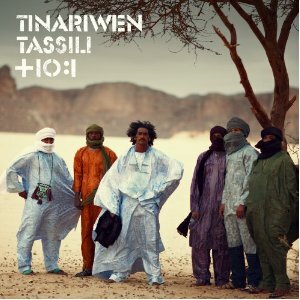 Album of the Day: TASSILI by the band TINARIWEN. In an age of bits and bytes I still like having the CD (still bits & bytes, but more of them :)). The physical item, the liner notes, the process, Plus MP3 is not the music, it is an approximation of the music. A compression of the music. A whole generation raised on the lie of music, rather than its truth. Something the NO APOLOGIES podcast said about kids raised on their mp3 downloads and American Idol, realizing when they go to a real concert, that till then… they had never actually heard music before. Today’s recommended CD is TASSILI by the band TINARIWEN. “Just as it took a bitter, misguided war to kick-start the Summer of Love, Tinariwen was born out of refugee camps in North Africa in the early 1980s during a prolonged period of unrest. This band of genuine nomads turned rebel fighters might never have made it out of the desert and onto the world stage if French band Lo’Jo hadn’t caught Tinariwen performing at a festival in Mali in 1998 (eight years after it had returned to its homeland from exile) and invited the musicians on tour. Since then, championed by the likes of Robert Plant and Carlos Santana, the band has received numerous awards and accolades, and stands at the forefront of desert blues. Not bad for a band that didn’t acquire its first acoustic guitar until 1979, and for years after would perform for free for anyone who had a blank cassette and was willing to record the performance to share with others — basically YouTube without the Internet.